For some time now, streaming service Netflix has been giving more and more representation to the LGBTQ community with its original programming. The new Spanish high school drama Elite, for example, features an oh-so-cute gay couple - “Omar” (Omar Ayuso) and “Ander” (Aron Piper). Now, as Taylor Swift likes to sing, “haters gonna hate, hate, hate.” And they did. 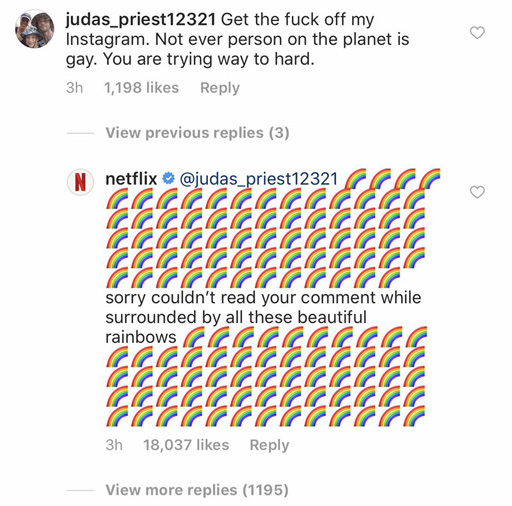 There were tons of very supportive comments but one, from a user named ‘judas_priest12321’ caught the attention of the folks handling the Netflix account. Grammar and spelling issue aside, the negativity reeked. But Netflix was not having the hate. That comment inspired thousands of rainbow and pride emoji themed responses. The post has garnered over 400,000 ‘likes’ so far, and an amazing 12,000 comments. This isn’t the first time Netflix has defended its LGBTQ-themed programming. Back in August, when the service announced Dancing Queen, a new docu-series following RuPaul’s Drag Race alum Alyssa Edwards, the folks running the network’s Instagram clapped back at several haters who felt the need to hate on the upcoming series. You can check out the trailer for Netflix's Elite below, and find more info about the series here.